Home Weird	Atmospheric Monsters from Space!? Atmospheric monsters, bizarre and seemingly impossible creatures. These sky-bound beasts soar silently above the human race, defying the conventional laws of physics, and their origins and intentions remain one of the most perplexing and fascinating mysteries in the realms of both ufology and cryptozoology. Most switched in people would readily concede that the oceans of Earth have yet to reveal even close to all of the mysterious creatures that dwell in their vast deeper depths. Scientists have suggested that there are nearly a million undiscovered species lurking in the briny deep, while others insist that the number is a good deal higher. While scientists have no problem accepting that the seas are chock full of as yet unidentified life-forms, they reject the idea that the ocean of air above our heads might be just as full of unique and currently unclassified species, that quite possibly travel through space and time before they reach our planet. (not ours literally). Right, let’s take this overwhelming figure and compare it to the square miles of water said to be on the big blue orb we call Planet Earth. Again, according to mathematicians whose work I can only accept at face value, we’re dealing with the not insubstantial sum of 139,668,500 square miles. Even as non-numerical a mind as the one I possess can see that the difference is tremendous. So if we are to concede that the ocean harbours scads of unknown life-forms how can we ignore the same potential in the vastly more expansive heavens above, which are surrounded by an infinite Universe! Just imagine seeing this come down from the Heavens. Okay, maths lesson now over. First off I want to acknowledge that Micah Hanks, from Mysterious Universe, has already broached this fascinating topic in his article “Airborne Anomalies: Rethinking Atmospheric Life forms,” which is a fantastic read. Still, as informative as that is, I found this subject so very captivating that I had to take a crack at it, so forgive the pinch of redundancy. So what the heck is it that might be living above us?!? So-called atmospheric monsters have been with humanity for a very long time, in fact centuries! Descriptions range from vaporous, cloud-like beings to “air whales” and “air krakens” to translucent, floating jellyfish that dip in and out of clouds with no visible means of aerodynamic propulsion. There are also the oft debunked, multi-winged “rods” or “sky-fish” and airborne man eating super-amoebas and even one-eyed, flipper bearing, headless dragons. Some are said to be huge gargantuan beasts, which have been incorrectly identified as flying saucers and others are so small and swift that they can barely be perceived on video freeze frames, much less with the human eye. It has also been suggested that — much like animals that dwell in the pressurized depths of the deepest ocean trenches — many of these atmospheric animals are unable to survive on the surface of the Earth. Some even believe that the gelatinous “star jelly” so often found following meteor showers may well be the decaying remains of these ostensibly invertebrate beasts. Perhaps falling stars and other earthbound debris strike these creatures in mid-flight, tearing them apart with the force of their impact and sending them hurtling to the ground in as yet unidentifiable hunks…could this explain the numerous strange oddities seen around the world!? Like a Jellyfish in the sky. Origin also remains a point of contention between supporters of the existence of atmospheric monsters; that is, whether or not they we are dealing with alien entities of unknown extraction or creatures that are indigenous to Earth. Most supporters believe that wherever these beasts come from they are non-sentient animals that live their sky-bound lives reliant on instinct rather than intellect. But, of course, they could be wrong…us humans as we know, don’t always get things right! Carl Sagan’s potential atmospheric Beasts of Jupiter. Constable further proposed that these atmospheric monsters spent most of their time in a virtually invisible low-density state, but when they increased their density (possibly while in search of sustenance) these odd life-forms became visible. He also believed that the use of radar devices in the 20th Century somehow disturbed these sky beasts, forcing them from their usually concealed state into a more perceptible one. As if that weren’t enough, Constable then went on to suggest the literally horrifying premise that these “critters” were not only carnivorous, but that they were likely responsible for the plethora of inexplicable animal mutilations as well as the scores of human beings who are reported missing every year (a number which increasing daily). It goes without saying that the thought of huge, voracious, virtually undetectable predators that can descend from the sky in a flash to claim their unwary victims is not a comforting one. Perhaps it was Constable’s alarming theory that inspired Japan’s Toho Studios to produce “Dogora, the Space Monster.” Dogora, a massive, floating jellyfish-like creature that hovered over Japan scooping up its terrified victims with long, whipping tendrils, was brought to life by renowned Godzilla collaborators director Ishirō Honda and special-effects wizard Eiji Tsuburaya in 1964, and may well be the best cinematic articulation of an atmospheric monster ever created. While Dogora is well known to cult and kaiju film enthusiasts, arguably the most celebrated real life encounter involving an alleged atmospheric monster hailed from Crawfordsville, Indiana. According to the account published in the September 5th, 1891 edition of the Indianapolis Journal, at about 2 am. on September 4th, two men were repairing a wagon when they looked skyward and were shocked to see what they described as a “horrible apparition” soaring above them. The men asserted that the multi-finned, rectangular, headless creature “swam” no less than 100-feet above them and they gauged its size to be approximately 8-feet wide and 20-feet in length. The men would later confirm to reporters that the beast was definitely animate. The men watched in horror as the creature propelled itself through the heavens with its numerous fins and even circled above a nearby home. The monster then vanished as it travelled eastward, only to reappear moments later. This was about all the eyewitnesses could take and the men chose this moment to abandon their repairs and flee for their lives. This utterly bizarre creature would be easy enough to dismiss as a drunken hallucination or an outright hoax were it not for the corroboration of another eyewitness with an impeccable reputation. The witness in question was one Reverend G. W. Switzer, a local Methodist pastor who, along with his wife, also claimed to see the sky beast. As if that weren’t enough, the following night the thing returned, but this time it did not just show itself to a handful of stranded observers. According to reports published by the Indianapolis Journal, hundreds of witnesses testified that they watched the anomalous airborne entity fiercely flapping in the night sky. The Crawfordsville creature undulated above the throngs of awed onlookers at a height of about 300+ feet, until it abruptly plummeted earthward toward a group of spectators. Those who narrowly avoided the apparent attack of this beast swore they could feel its “hot breath” as it rushed straight past them. Early paranormal chronicler and author, Charles Fort, was convinced that there was no Rev. G.W. Switzer and that the entire event was a hoax, but once he looked into the matter he was shocked to discover that the pastor not only existed, but he confirmed his previous testimony to be true. One incident reported by a policeman details a run-in with this (or a similar) entity that occurred while the officer was bicycling on his patrol route. The lawman claimed that “it” enveloped him creating the sensation of being wrapped in a “soft blanket” that smelled of “mildew.” The being, which the officer was convinced was alive, swiftly soared away, but the shaken officer claimed that it had been one of the most terrifying experiences of his entire life. Since the dawn of photography there have been scores of photos of alleged UFOs, but there are dozens that do not seem to have the classic earmarks of a machine tooled vehicle or surveillance device. These anomalous objects seem to have strange, almost organic shapes and move in ways that seem counterintuitive for a technologically based flying craft. 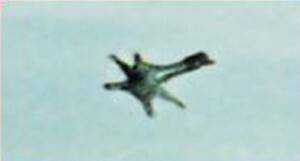 One of the most intriguing anomalous UFO photographs — which may well represent an atmospheric monster — was taken by scientific journalist Bruno Ghibaudi on the afternoon of April 27th, 1961.On the day in question Ghibaudi was driving along the highway that ran adjacent to Montesilvano beach in Italy when he blew a tire. Ghibaudi immediately pulled over and began changing his flat. The job was proceeding smoothly when he noticed a bizarre, multi-winged, or possibly finned, “object” soaring over the ocean at a low altitude. The strange craft was heading directly toward him at an incredible velocity, but, much to his credit, Ghibaudi did not panic. Instead he reached into his car and retrieved his camera. As the odd object passed overhead it slowed and made a sharp, northward turn. 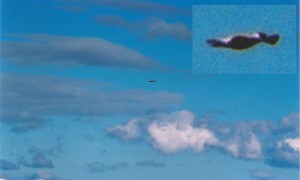 Ghibaudi managed to snap a single photo of the UFO before it accelerated out of sight. While some claim that the image shows an interstellar vehicle, there are others who believe that it is actually a living creature. Please check out the image below, it looks very much like some oddly designed shark!? This next picture was also allegedly taken in Italy. While there’s not a lot of information surrounding this image, its uniqueness warranted its inclusion in this article. According to online accounts, thisphoto was snapped in the middle of the day sometime in July of 1999, by an unnamed Italian Dentist. Supposedly the object — which looks kind of like a stubby tentacled squid — was reportedly silent, exceedingly large and soaring at a incredibly high altitude and rate of speed. Some of the witnesses claimed that the UFO had lights along the base. Were these artificial lights or an example of bioluminescence? Perhaps we’ll never know. The next case involves a photographer from New Zealand named Michael White who was shooting pictures of the sky when he noticed what he described as a “strange looking dark cloud.” Apparently the cloud remained immobile for the better part of half an hour when it suddenly disappeared. White had managed to snap multiple photographs of the cloud, but it wasn’t until he later developed the images that he realized how unique this entity was. In the photo he discovered a mysterious object that resembled a sort of rippling, possibly organic, manta ray-like object. The most intriguing part of White’s story is that he claimed that he did not notice the “object” when he took the picture. White insisted that all he saw was a “cloud” that he described as being “fibrous” and “peculiar looking.” He even went so far as to state that he believed the weird cloud could “sense” that it was being filmed and vanished as a result. Does this imply that this fibrous cloud-like shape was merely camouflage for a potentially sentient being? 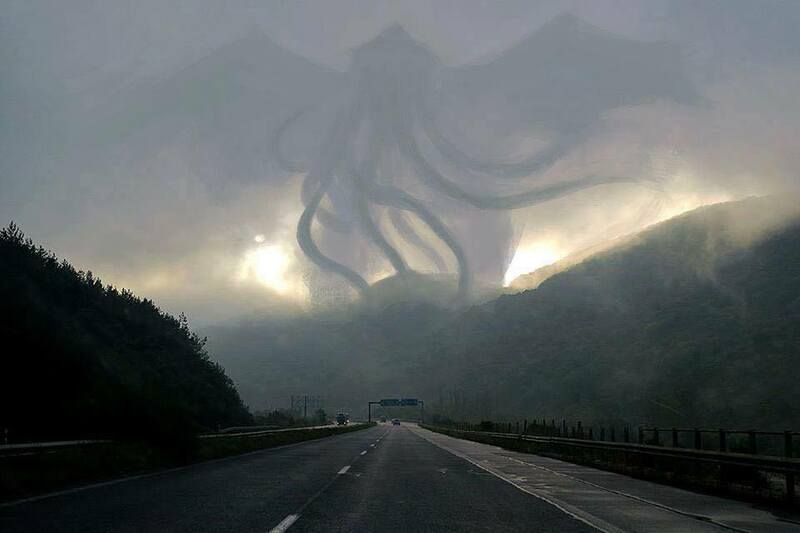 If this happens to be the case, then that gives rise to the supposition that strange, undulating entities may be constantly cruising overhead and all our human eyes perceive are plain, old, ordinary clouds. If that is true, then our world is a mysterious place indeed. On the afternoon of November 3rd, 1973, A Mexican banker and his family spied a strange object rocketing in a westerly direction over Cocoyoc, Mexico. 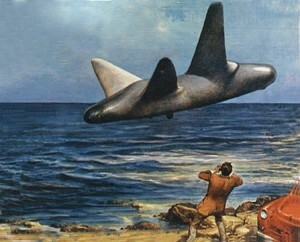 The banker’s wife claimed that the object was roundish and did not resemble any traditional aircraft that she knew of. The banker stopped his car for a better look at the unusual object. He and his wife quickly exited the vehicle and watched as the UFO blazed across the brilliant blue sky. Thankfully, the banker had the presence of mind to grab his camera and he managed to shoot a photo of the “craft” before it shot out of view. Is this some weird sky anemone or merely a very strange balloon caught in the wind!? 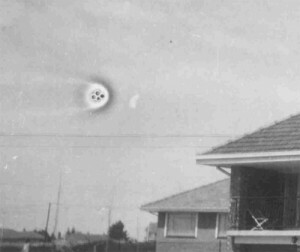 Finally, last but definitely not least, in 1963, in the Northcliff region of Johannesburg, South Africa, a real estate agent was taking pictures of available houses for a local newspaper advertisement when she captured an image of a truly unique UFO. The object resembles what seems to be an odd cellular structure. Perhaps this is a picture of one of Constable’s “critters” or maybe it’s something else all together. The above cases represent merely a handful of the accounts and photographs of what might well be atmospheric monsters. But as many images as may be out there, the general consensus remains that these animals can not only modify their size and density, seemingly at will, but also employ a unique and extremely effective form of camouflage to conceal themselves. This means that if these creatures really do exist, there may be thousands, if not millions, floating above each of us at this very moment and we’d never even realize it. Perhaps these speculations are nothing more than flights of fancy (please excuse the Pun) but if they prove to be genuine then it means that scientists have barely scraped the surface of the fauna that lives below… and above… our world. Or perhaps this is another reason for the apparent ‘chemtrials’ in the sky, designed to hide things they do NOT want to see! Whilst a lot of the above must just seem like elaborate fantasy, there is definitely some truth in these stories. British Scientists in 2012 discovered tiny ‘space bugs’ in the earths Atmosphere. Tiny organisms were discovered by University of Sheffield experts on a research balloon they had sent 27km (16.7 miles) into the atmosphere during last month’s Perseids meteor shower. The microscopic bugs were detected when the balloon landed back on the ground in Wakefield, West Yorkshire. But the scientists insist the samples could not have been carried from the Earth’s surface into the stratosphere – the second layer of our atmosphere, which stretches up to 50km (31 miles) from the ground. Strict tests were taken to avoid any contamination, they said. Another ‘Alien’ bug caught in the earths atmosphere. Professor Milton Wainwright, who led the team, said: “Most people will assume that these biological particles must have just drifted up to the stratosphere from Earth, but it is generally accepted that a particle of the size found cannot be lifted from Earth to heights of, for example, 27km. He went on: “We can only conclude that the biological entities originated from space! The findings are to be published in the Journal of Cosmology. So it appears that life travels though the vastness of space and is entering our atmosphere perhaps on a daily basis. If this is so then this opens up many more questions; could it be that the human race and all other lifeforms on planet earth, arrived here on this planet from space! And could it be that other Alien beings are going to soon start evolving and forming into something else here on Planet Earth….perhaps this explains some of the above sightings!? Another ‘incredible’ finding by scientists recently was tiny microbe like ‘seeds’ found above earths atmosphere, which appear to be sealed with Titanium and inside is some kind of biological ‘goo’ could we have been perhaps ‘seeded’ by ET beings…..or perhaps are we being Terraformed!? Interesting times lie ahead for us all. Could huge, alien ‘air monsters’ live inside the clouds above the Earth?